Unsure of how to get started to invest in Malaysia? The first step we need from you is to provide us with information! 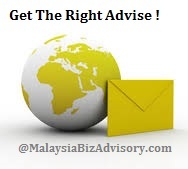 Without complete information, we cannot assist you to provide better advice to match your business intend in Malaysia to the relevant authorities demand to ensure all necessary approvals able to obtain from licensing to work permit, be it Labuan International Company or local Malaysian Sdn Bhd Company set-up. The more information you provide, the better it would be for us to provide you with the right advice to meet your objectives in Malaysia. Rest assured all your data will be kept confidential in which we respect privacy having served the foreigners communities for the past 18 years! It important to get the right advice when you are stepping into a new land with new ventures! 1. It is absolutely important to get the right entity and business structure from the first step in order to get the all necessary approvals from various Government ministries, to avoid waste time and cost. 2. The right entity will lead you to great tax savings. 4. Permission to obtain an expatriate visa under the company will be given according to the current industry needs and it may not apply to all industries.